Molly is a licensed cosmetologist with an associates degree in Interior Design and a mosaic/mixed media artist. She is the owner/operator of A Work of Art Studio & Salon, a full service salon with art classes and gallery/retail space in a historic building in Lakeview, MI. She is a self taught mosaic artist of 16 years, literally using a hammer and pliers to smash glass until she learned there were specific tools for the art. Her original moniker should have been “Carpal Tunnel Mosaics” but her husband thought the name “Smashing Mosaics” was more professional. 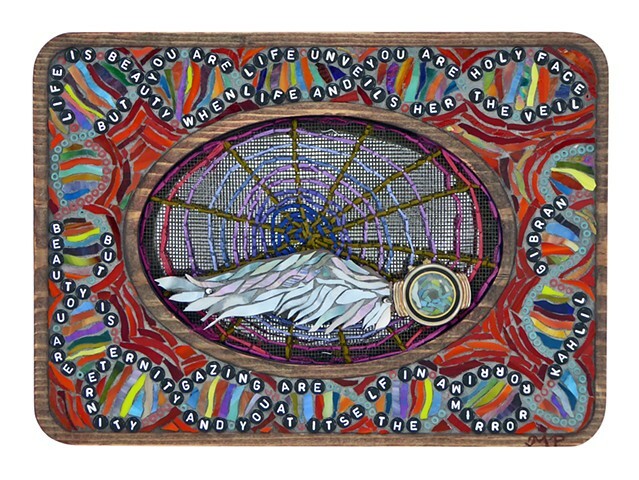 For her auction piece, Unveiled, Molly used a frame base with routed interior to place tesserae which consists of stained glass, beads, and alphabet beads to create the shape of DNA including the quote: “Beauty is life when life unveils her holy face. But you are life and you are the veil. Beauty is eternity gazing at itself in a mirror. But you are eternity and you are the mirror.” ~Kahlil Gibran. Inside the frame is a mirror covered with a wire screen face embroidered with a spider web. An individual wing was cut out and mosaiced and attached to a watch face over a mosaic eye. “Unveiled” symbolically represents the notion that the creation of our world perception is solely in our hands and spiritual outlook (when looking in a mirror you face all of creation and this truth can set you free). Even though Molly works as a hair stylist to pay the overhead, she loves to teach and host art classes at her shop. She works on two to three commission pieces a year in between clients.